I'm incredibly pleased to announce this Ruche giveaway! They are offering a wonderful beaded and layered Cherokee Feather Necklace by Thursday Island. With Cherokee roots myself, I can't help but be smitten with this fun accessory! Be sure to leave a link of proof in separate comments for each action! Winner will be chosen at random on 5/15. *Our winner is Paul Michele. Congratulations! Great necklace! So I can't decide which of their other items is my fav -- so many. But I love the "all you need is love" necklace and the "royal rose and pearl" necklace and the "come fly with me sparrow" earrings. I bookmarked the site for future visits. Thank you! I LOVE Ruche! The dress in my engagement photos is from there. Right now, I'm digging the anchors aweigh dress. I might have to get it for my bachelorette party -- it's gonna be on a cruise. So perfect! I followed Ruche on Twitter! And became a fan on Facebook! Oh wow... I LOVE that necklace, and pretty much everything on their site - it's all so feminine and lovely. How fantastic is the Playdate with Polka Dots dress?! So fun! Following on Twitter as well! I love the Nicole Magical flower ballet flats in burnt orange. They are so springy and I'm always looking for cute flats for work! I think I need them! I really liked the marina del rey aqua teal top.I had to bookmark Ruche so I can go back and explore some more ). I love love love the sioux tribal beaded necklace!! So pretty! I love the pearly cocoon leaf necklace! Fan of Ruche on Facebook! Fan of Haute Whimsy on Facebook! I think that the Baby Blossoms in the Night Tube Dress is very pretty!! I just love the silhouette flower purse in marigold. So beautiful!! I love the sweet angelic shimmer dress! love this blog :) will be following. 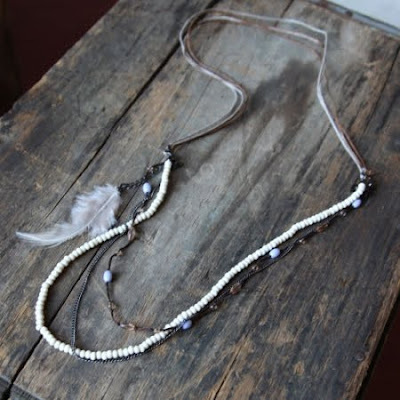 My fav item is the swallows of capistrano necklace in blue patina. Their pieces are great and their prices even better. We dig the funky geometry of the "exprimez mon art pocket tunic". Thanks for introducing us to a new online shopping adventure! Can't help but adore the pick a flower linen engineer cap from Ruche! I could spend a lot of time browsing on that site. My favorite dress is the what's in a name rosy dress. Perfect for spring and into summer! and I now follow their blog! I love the All For The Love Of You Daisy Dress. I love the Patch Perfection Tank! I love the Pink Studio "Island" grey open toe sandals. The black bowling purse is my favourite. I love the Violet Bellflower Indie bracelet from Ruche as it reminds me of my garden. I'm loving the hey jude chambray dress. i like the locket necklace! I like the floral field ruffle dress. I like the ruby red multi-stranded bracelets. Calies coral embroidered top is my favorite it is so hard to choose with so many to die for items! I LOVE Ruche! I can't choose a favorite item, but I do love the Blissful Pleasure Dress! Its adorable! I follow Ruche on Twitter from @polopony95! I fanned Ruche on Facebook! I love the delightfully pink cardigan! I absolutely love the sapphire bowline pocket dress by Nick and Mo! I follow Ruche on twitter, username slowclublover. I love ALL of their stuff. The neopolitan color block dress is super cute! I like the Sweet Disposition Lace Dress. I love the all for the love of you daisy dress! I sent Ruche a friend request on Myspace! I tweeted for a 2nd time! I really love the stitched pinstripe button up. I love the tie me up with ribbons bracelet!!! I love the Coral COast Top. I think the cream rose indie necklace is absolutely adorable! my favorite item is the - grab some shade linen floppy hat. Love, love, love the caramel braided avenue tote. I like the paper clip heart earrings in gold. Thanks for the chance! I like Ruche on facebook. I like the roses de la nuit button down top. I love the little white lily headband! I became a fan of Ruche on Facebook. I added Ruche as a friend on Myspace.